President Trump’s administration filed a petition with the U.S. Supreme Court Thursday night seeking to reverse rulings by lower courts in Hawaii and Maryland that blocked a temporary ban on travel to the United States from six majority-Muslim countries. Federal judges issued a nationwide temporary restraining order and injunction that blocked the travel ban in March, after separate legal challenges were mounted by the International Refugee Assistance Project (which filed its suit in Maryland) and by the state of Hawaii. 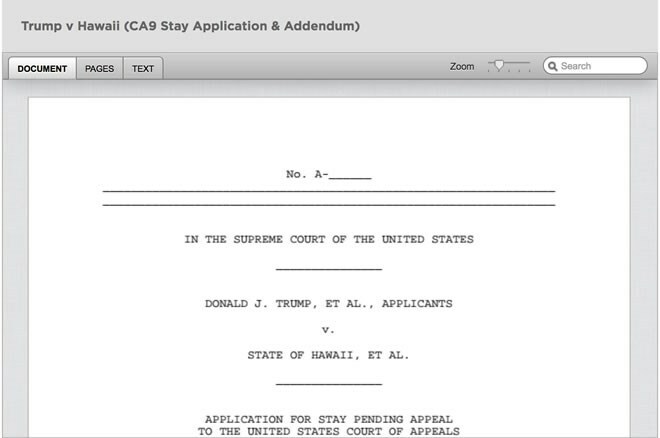 The 9th Circuit Court of Appeals heard arguments in the administration’s request for a stay pending appeal to lift the Hawaii injunction on May 15, but it has not yet ruled. Trump and the Justice Department are asking the Supreme Court to review the case in the 4th Circuit, and to place stays on the injunctions that resulted from both cases. The administration made three separate filings with a total of more than 880 pages late Thursday. The executive order was issued in early March. It “suspends for 90 days the entry of foreign nationals from six countries that sponsor or shelter terrorism (Iran, Libya, Somalia, Sudan, Syria, and Yemen),” the White House says in its Supreme Court filing. Trump’s executive order calls for a “worldwide review” of the visa process to take place during the three months of the travel ban. It would also suspend the U.S. Refugee Admission Program for 120 days and lower the maximum number of refugees who can enter the U.S. in 2017. 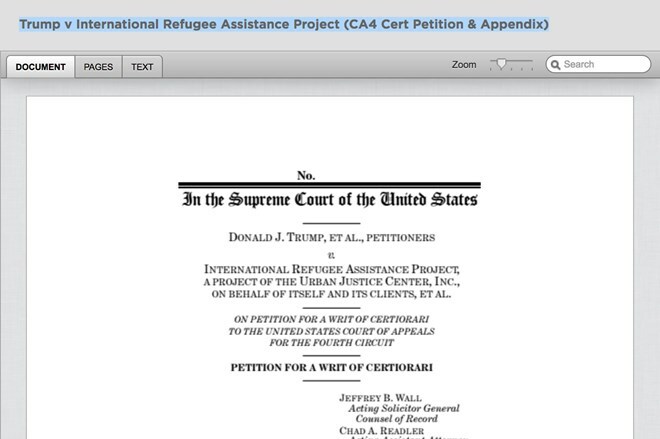 The two case in question are similar in that both of them sought to block the travel ban — but the Hawaii case also resulted in the court blocking the Trump administration’s plan to suspend the Refugee Admission Program and cut the number of refugees. The contested executive order is a revised version of Trump’s first attempt at a travel ban, which was issued in his first week in office — and which sparked a lawsuit led by Washington state. The temporary travel ban created chaos at airports both in the United States and abroad, as officials grappled with ambiguous instructions on whether and whom to admit to the country. A U.S. District Court judge in Seattle blocked the executive order. The U.S. Justice Dept. appealed to the 9th Circuit, which upheld the lower court’s injunction. After first pledging to take the case to the U.S. Supreme Court, the president issued a revised executive order on March 6, in an effort to address objections raised by the Seattle judge. The revised order appeared in the Federal Register on March 9 and was blocked by judges in Hawaii and Maryland.